The SRC has proven unpopular during its 16-year history. In this file photo, activists in 2016 called for an end to the commission. The SRC will vote to abolish itself on Thursday. The School Reform Commission, for the last 16 years the governing body of the Philadelphia School District, formally abolished itself in a historic vote Thursday night. Follow along here. What exactly is the SRC? Why is the SRC self-destructing? According to the resolution the SRC will consider Thursday (5,809 days after the body was created, if you're counting), it boils down to this: "The School District is no longer distressed" and "The School District no longer requires governance by a School Reform Commission." The resolution gives a laundry list of reasons why the district is no longer troubled — such as "all salaries have been paid on time without issue" and it "has not defaulted in payment of its bonds or interest on such bonds or in payment of rentals due any authority for a period of time of ninety (90) calendar days." The district is, however, projecting a deficit of $100 million beginning in 2019, and up to $1 billion over five years. The SRC was supposed to mean more funding for Philadelphia schools, a promise that has not been upheld. Why is the action happening now? 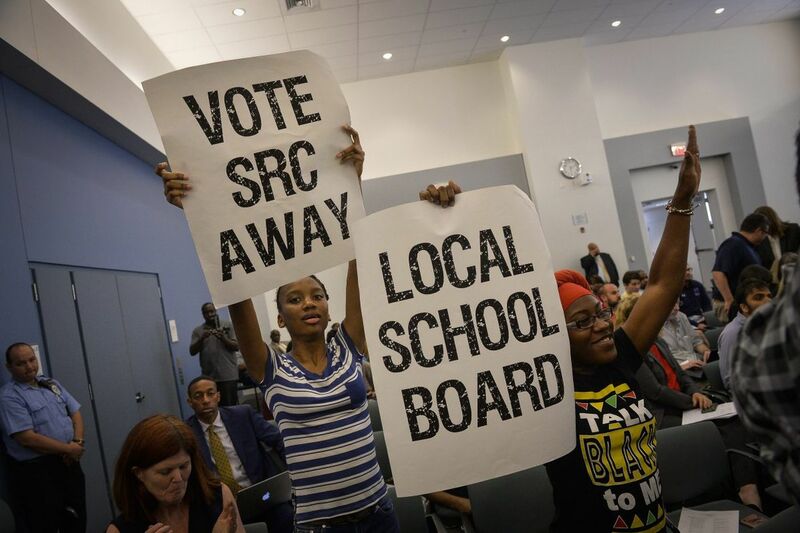 The SRC has not been especially popular since its inception, but the public clamor against it has risen in recent years, with a 2015 non-binding city referendum making clear Philadelphians' preference for local control. A coalition of groups allied to fight the SRC known as Our City, Our Schools and the Philadelphia Federation of Teachers, which was instrumental in the referendum, have made their wishes clear. But the formal call came on Nov. 2, when Kenney said he was asking the SRC to dissolve itself. He said the SRC was ultimately accountable to no one, that the city will step forward to fund the impending deficit, and that he should be held responsible for what happens to the district going forward. What happens next? What will replace the SRC? Thursday's meeting is scheduled to start at 4:30 p.m. (Hundreds are expect to celebrate the impending action at a 4 p.m. rally outside district headquarters at 440 N. Broad St.) The outcome is a foregone conclusion — only three SRC members need to endorse the dissolution, and McGinley, Richman and Wilkerson are all firm 'yes' votes. Green will vote no; he has said he has deep concerns about the district's finances and is "skeptical that the new board members will be able to respond to the inevitable difficult decisions ahead without putting political considerations first and foremost," It's not clear how Jimenez will vote. Even after the dissolution, the SRC will govern the district until June 30. Soon after the vote, Kenney is expected to name a 13-member nominating panel to put forward candidates for the nine-member school board that will replace the SRC. The nominating panel, by city charter, must come up with 27 candidates for the nine spots. All must be registered voters who live in Philadelphia. The mayor has said he expects to have the new school board members in place by March so they have a few months to acclimate themselves to the workings of the district. Current SRC members are eligible for consideration for school board slots, but they have no say over who is appointed. What happens to the contracts agreed to by the SRC? All contracts — including the one with the teachers' union and with William R. Hite, superintendent of schools — will remain in force when the SRC ceases to exist. Hite is under contract through 2022, and Kenney has voiced strong support for him.